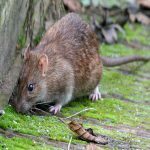 Brown rats (known as common rat, street rat, sewer rat, Hanover rat, Norway rat, Norwegian rat, Parisian rat or wharf rat,) are one of the most common species of rats. Brown rats are small animals with strong bodies, short limbs and long tails. Brown rats tend to be larger and more aggressive to animals, humans and each other than black rats. They are serious pests to farmers as they eat a wide range of agricultural crops. Diet: Sewer rats eat a wide variety of foods but mostly prefer cereal grains, meats, fish, nuts, and some fruits. Habitat: When brown rats invade buildings, they usually remain in the basement or ground floor. The rats also live in fields, farms, woodpiles and buildings. Brown rat nests are usually lined with shredded paper or cloth. Impact: Damage caused by brown rats includes chewing on materials, urinating on food and eating stored foods. They have also been known to chew on wires, which may pose fire risks. They also carry disease and ectoparasites. Rats will also attack both animals and humans.